DoubleTree by Hilton Fairfield Hotel & Suites is the latest addition to the DoubleTree by Hilton portfolio, one of Hilton’s 16 market-leading brands. This full-service property is equipped with 204 guest rooms and more than 16,000 square feet of meetings and events spaces. The hotel is conveniently located near major area highways with excellent access to Parsippany, Wayne, Newark Liberty International Airport, MetLife Stadium, Meadowlands Expo Center and New York City. The hotel’s recent transformation boasts contemporary elegance with modern décor, with interior upgrades in all public areas, banquet facilities, guest rooms and suites. These transformations draw inspiration from New Jersey’s nickname, the Garden State, and state insect, the honey bee. Specifically, the hotel converted 20 king guest rooms into double queen guest rooms to best welcome groups on leisure weekends and retreats – all with the goal to further meet the needs of guests, including corporate travelers, families, students and sports teams. 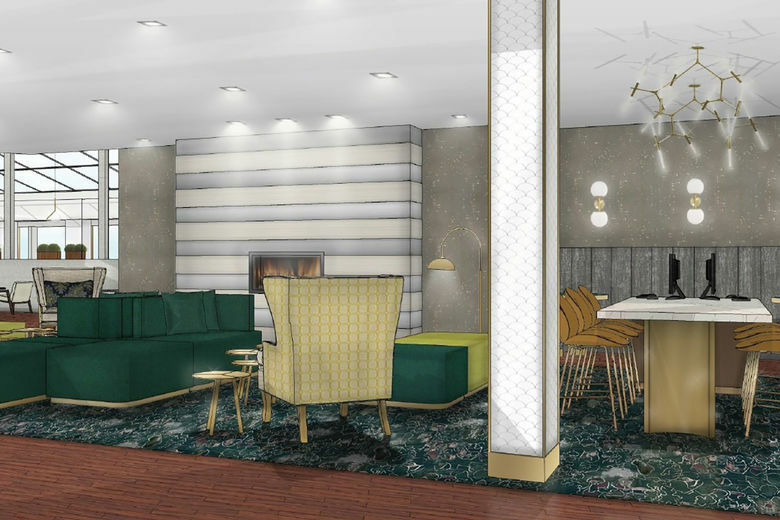 The hotel’s new restaurant, Nectar Kitchen + Bar, connects visitors to the myriad of fruits, herbs and vegetables grown in New Jersey and to the honey bees needed to pollinate them. The restaurant menu includes locally sourced seasonal items and was both inspired by nature and created to please savory and sweet palates. Nectar Kitchen + Bar has committed to help sustain the honey bee population through the use of local and sustainable products, as well as by giving back to the farming community to help with recovery. One dollar from each purchase of the restaurants’ signature dessert, Honey Lavender Crème Brûlée, or signature cocktail, the Bee’s Knees, will go toward the effort to help sustain endangered honey bees. Guests seeking exercise or relaxation have a variety of options, including a 24-hour state-of-the-art fitness center, indoor saltwater pool and a 24-hour business center. In addition, the hotel offers complimentary parking for guests and complimentary shuttle service within a five-mile radius from the hotel. Guests may take the shuttle to their local offices or explore shopping at the nearby Willowbrook Mall. With more than 16,000 square feet of meetings and events space, DoubleTree by Hilton Fairfield Hotel & Suites is the perfect venue to host a conference, meeting, wedding or other special gathering. Crystal Falls Ballroom is the largest banquet room at the hotel and features a cascading waterfall, an intelligent lighting package and a cathedral ceiling – all making the room ideal for weddings, social events and conferences that accommodate upwards of 400 attendees.